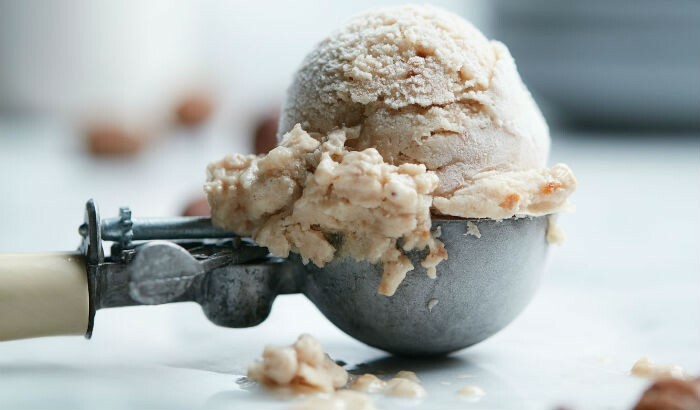 If you think chestnuts are only great when roasted, this chestnut ice cream recipe is sure to make you think again. Adding roasted chestnuts not only gives this frozen treat great texture but also brings in the holiday vibe the sweet and creamy way. Of course, it’s also the best way to cool down this summer while enjoying traditional Christmas flavours. There’s definitely more to love about this recipe other than its mellow, nutty flavour. Aside from it being a healthier dessert option with reduced-fat yoghurt used in place of cream, it’s ready within minutes and does not even need an ice cream maker! This recipe makes about 4 cups of ice cream that taste wonderful on its own and taste even better when paired with apple pie or delicate butter cookies. Hey, it’s Christmas time after all. So go indulge and enjoy this dessert with family and friends! Place the chestnuts, yoghurt, and dates into the Vitamix container in the order listed and secure the lid. Select Variable 1. Turn the machine on then slowly increase it to the highest speed. Blend the mixture for 30 seconds or until you achieve a very smooth base. Stop the machine. Add the ice cubes and secure the lid. Select Variable 1. Turn the machine on then slowly increase speed to the highest setting. Blend the mixture for 20 seconds, using the tamper to push ingredient into the blades. Serve immediately. You can put all ingredients into the blender at one time but by blending the base first, you are assured of a very smooth, lump-free texture. The recipe and image were adapted from Vitamix.